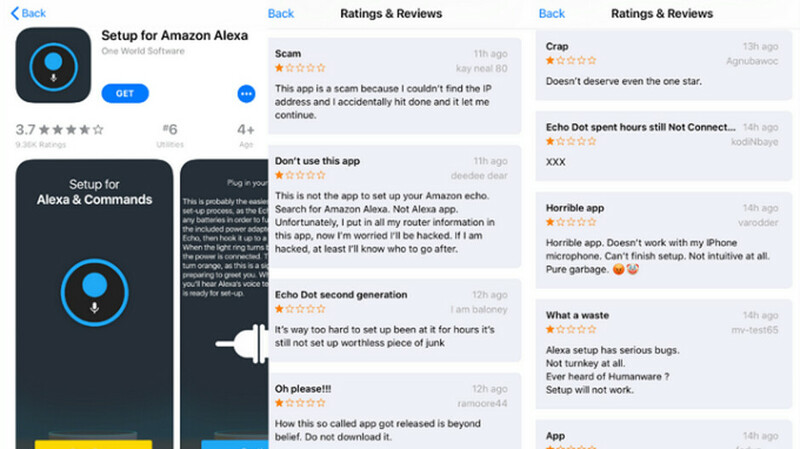 With all of the new Alexa powered smart speakers that were opened during the holiday season, this app has hit #6 in the Utilities category, and is the 60th most installed app overall in the App Store. Those receiving an Echo device might have searched the App Store for "Setup Amazon Alexa," which not by coincidence is the name of the app. The app apparently tries to keep users engaged long enough to start serving ads, thus ringing the cash register. The developer is a company called One World Software, which has two other apps available for iOS users. One is called "Marketplace – Buy/Sell," and the second is a 99 cents paid app titled "Any Font for Instagram." However, it appears that all three were removed by Apple earlier today. If you have any of these three apps on your iPhone, you might want to uninstall them immediately. If you did get a new Alexa powered smart speaker for the holidays, you should install the official iOS or Android Alexa app to help you setup the virtual assistant. Um. You should probably check the reviews for any app you intend to install. Ignoring those is your problem. What’s unsafe about an app pushing ads. I remember that nearly all android versions same iOS apps push ads instead of upfront charge. By your argument - majority of android apps are unsafe? Maybe re-read my 'argument' again dude. And if your memory serves you well enough you'll also remember that there are paid app versions for almost everything in Android. I didn't say ads were unsafe, but asking for IP addresses etc sounds fishy to me. This has nothing to do with IQ, but the iPhone users I know are not tech savvy. Then here comes a loser who criticize the grammar instead because it can't construct a valid counter argument. He couldn't construct a complete sentence either - he forgot the period. i forgot you're on your period. The beginning of a sentence should start with a capital/upper case letter. copied this from google? hahah, at least you're evolving. no, the ones directed to you are good with a lowercase letter. yeah, sure, a valid counter argument to what? that generalizing stupid statement? if you want to criticise someone at least try to spell it correctly, i mean, i know you android users aren't so smart, but you can always use google. I wonder how many fulz fell for it. Apple also has laptop's and desktop systems. Just saying. laptops***, damn this grammar. Is it your period affecting your spelling skills or you're just plain stupid? You left out a comma before the word (or). If you like correcting grammar then correct it properly. It’s ‘have’ not ‘has’ since the noun is plural (laptops). Further, you corrected a spelling and cried out for grammar mistake while you didn’t care about actual grammar mistake. Do you even know what grammar means? The correct sentence is: or are you just plain stupid? Don't try to correct grammar when yours is s**tty as hell. no, you're wrong, i wasn't asking him if he's plain stupid (cause he clearly is), i was asking which one of those two affirmations applies to him. so therefore, it's you're. Then you should have said: Is it your period affecting your spelling skills or the fact that you're plain stupid. So your sentence is still incorrect. The only plain stupid one I see is you. Nothing philosophical or smart about correct sentence structures, just basic English 101. If that sounds philosophical or smart to you, that says more about you then. You need to check your grammar before you call out others on it. Correct punctuation and word usage is key. Also take into consideration that not everyone on here is a native English speaker/writer. Yes, but one could own an iPad, or Mac without owning an iPhone, thus putting them in the "Apple users" but not necessarily iPhone users. Not mutually exclusive.